Human rights campaigners have accused the Charity Commission of failing to protect the public interest by allowing the charity status of JNF UK to continue. John Nicholson from the Stop the JNF campaign said that “in a period when we hear almost every day of regulatory bodies being condemned for failing to carry out their core duties, we expect the Charity Commission to take the concerns of British tax payers seriously”. Nicholson explained that “JNF UK and its charities are involved in the violation of Palestinian rights. Their primary aim is to settle Jews in Israel-Palestine which is not a charitable purpose under British law. Our tax payers money should not be helping the destruction of Palestinian villages and removal of Palestinians from their land so that leisure parks can be built for the state of Israel”. This is not the first time the JNF has come under fire. Over the years human rights campaigners have made complaints to the Charity Commission about the role of the British branch of the JNF organisation in Israel’s policy of administration of large areas of land and related services for exclusively Jewish use. In 2010, David Cameron resigned as patron of the charity making it the first time for one hundred years that a British Prime Minister has not agreed to lend their support. Last year sixty eight MPs signed an Early Day Motion in Parliament saying that “there is just cause to consider revocation of the JNF’s charitable status in the UK”. The Charity Commission response has so far been to accept JNF UK’s assertion that they are not part of the JNF organisation based in over fifty countries including Israel. The Stop the JNF application to the Charity Commission for the removal of JNF UK charities from the register of charities, however, exposes the close ideological and partnership links between these organisations. The application also makes the case that it is JNF UK that is guilty of complicity in human rights abuses and of running ‘sham charities’. 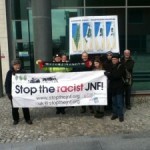 To mark International Day for the Elimination of Racial Discrimination on Thursday, campaigners handed in the Stop the JNF application to Charity Commission offices in London, Taunton, Newport and Liverpool. Nicholson said that “the Charity Commission has so far failed to act and failed to protect British tax payers from this abuse of charity law to assist a foreign government, Israel, in the setting up and maintenance of a land management system based on inequality and segregation”.